For over 60 years, Swedish toy maker BRIO has been selling a line of wooden toy trains. The company’s train sets are known for their bright colours, intuitive interlocking track system, and charming simplicity – making them suitable objects of play for young children. 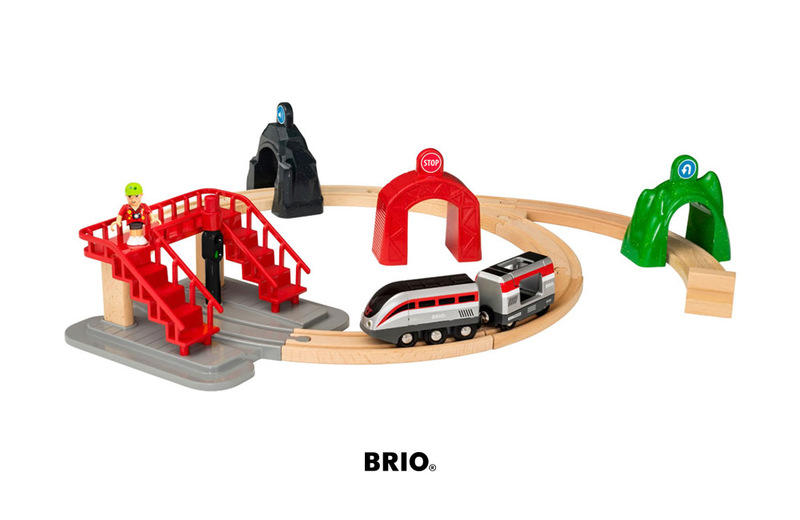 With their recently released Smart Tech Engine Set with Action Tunnels, BRIO has added a new high-tech wrinkle to an old classic. The 17-piece set consists of an electric train, wooden track, elevated pedestrian walkway, three colour-coded plastic tunnels, and a play figure. The set’s nine pieces of track provide a layout that measures roughly 23-inches x 30-inches. The integrated tech in the battery-operated smart engine allows it to communicate with the chip-enabled tunnels and bridge. Each tunnel has a specific action associated with it. As the engine passes through, it will automatically stop, backup, or blink its lights. Three buttons on the train itself allow it to move forward, backward or emit a joyful choo-choo sound. To encourage open-ended play, BRIO also sells some complementary smart tech add-ons, including a washing station and track switches. The Smart Tech Engine Set’s track is also the same as previous models, allowing the smart technology to be easily integrated with an existing layout. BRIO’s Smart Engine Set with Action Tunnels is available now from a variety of on and off-line retailers for a cost of $89.99 USD. Funko, one of my favorite purveyors of pop culture, recently unveiled a new line of Pop! Home ceramic mugs shaped like iconic characters from the Star Wars universe. The Desktop Skee Ball game from UncommonGoods offers a miniaturized version of everyone's favorite childhood pastime.